Before you head out for your summer travels, use these tips to keep stress at bay. The summer is here, and it should bring with it six more weeks of sunny weather and relaxation. In fact, you might be taking advantage of the season by heading out on a much-deserved vacation! The only problem? Travel can get a little hectic. Before you jet out on your upcoming vacation, use these summer travel tips to reduce stress. Leave early. Start your vacation early to beat stress. Airport lines have been at record lengths this summer, and nothing will get your trip off on the wrong foot like stressing about a missed flight. You can use the TSA website to check on security times before you leave for the airport, but it’s a good idea to build in some cushion time. If you’re traveling internationally, experts advise arriving at the airport three hours before your flight. Pack light. 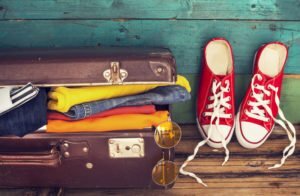 Whether you’re taking planes, trains, or automobiles to your final destination, packing wisely will benefit you. It clears up more legroom during your travels and makes it easier to get to where you’re staying. You’ll be much happier toting a lightweight suitcase around unfamiliar streets than lugging a mountain of luggage. Stay healthy. Sickness and vacation shouldn’t go together, but they all too often do. Make it easier for your body to fend off illness by getting lots of sleep and drinking plenty of water leading up to your trip. Talk to your doctor about vitamins or vaccinations that could benefit you, too. Then, while you’re traveling, stay hydrated and wash your hands often. We hope this guide helps you avoid stress during your summer travels so you can rest easy! We want to help you do just that by offering you homeowners insurance. With the right coverage, you can relax knowing your home is protected while you’re away. To learn more, contact McCarty Insurance Agency in Fresno, California.